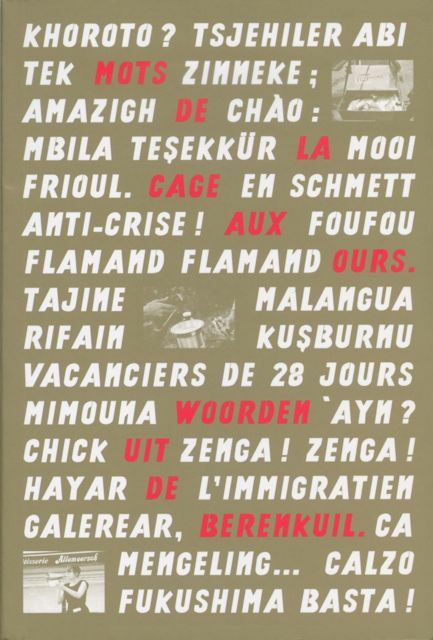 Published by the non-profit organisation Constant, Mots de la Cage aux Ours/ Woorden uit de Berenkuil gathers colloquialisms used in and around Place Verboeckhovenplein in the Brussels commune of Schaerbeek (FR) or Schaarbeek (NL). Nicknamed the ‘bear cage’ or ‘bear pit’, this popular neighbourhood is home to various immigrant communities, and the languages covered in the dictionary thus include, besides French and Dutch, Albanian and Arabic, Cameroonian and Chinese, Lingala and Turkish, among others. Besides the ‘dictionary’ section in which the various terms are explained, the book also includes a number of texts on language and the neighbourhood. An English version of these texts is available on Constant’s website. I proofread all the English translations.